Once more of the the outcast of the social network community compared to its more news making counterparts - Facebook, Instagram, Twitter, and Snapchat - LinkedIn has been quietly regaining attention from business professionals. Don’t call it a comeback, but with a focus on written content, personal videos, and engagements via comments vs. just sharing articles, LinkedIn has worked its way back to prominence despite some still seeing it only being good for recruiter and sales spam. And with 500 million subscribers, revenues of $960 million, and a market capitalization of $14.2 billion shows that some people out there love it. A lot. In the episode of Pricing Page Teardown, Patrick and Peter, show their sneaking admiration for this product. Or rather its pricing. Because LinkedIn doesn't care that they are expensive. In fact, the data suggest that is exactly what they need to do to grow their revenues even further, and potentially even acquire more customers. For anyone who has a LinkedIn profile, one thing stands out about signing up for the premium version of the service—it is not cheap. Whereas you can use every feature Facebook and Twitter have to offer for nothing, you can only do the basics on LinkedIn without signing up for one of their subscription packages. This is a great pricing strategy lesson. When you look at your willingness to pay data, remember that there are customers all along that range. There are more customers at the bottom, and you are going to hit the sweet spot of acquisition and monetization around the median. But the customers with the highest willingness to pay are the ones that should really find value in your product. 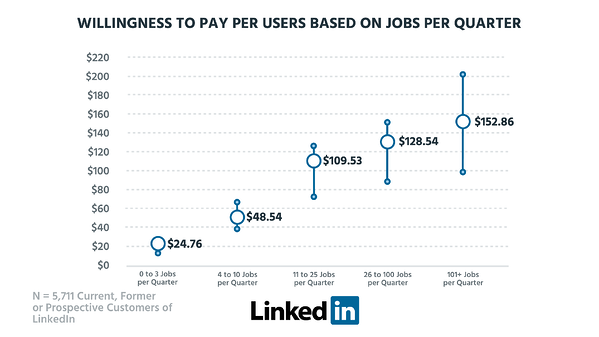 The data also shows that LinkedIn could be pushing their pricing even higher. Though segmented along role lines, differentiating tiers within these roles is the next opportunity for LinkedIn. 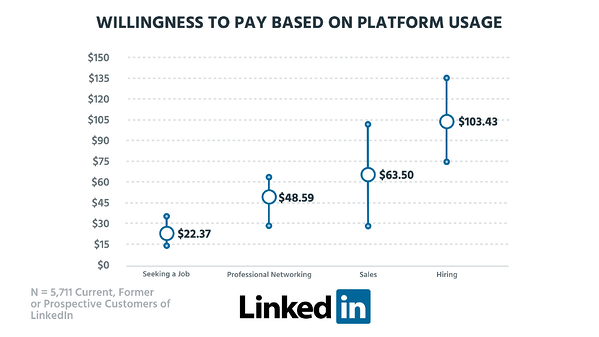 Some of these possible tiers are below where LinkedIn's pricing currently sits. For the people at the low end of need, 0 to 10 jobs per quarter, LinkedIn has effectively decided to sacrifice these potential customers. But once you are a serious recruiter looking to hire hundreds of people a year, access to the pool of professionals on LinkedIn goes from being a nice-to-have to a necessity. And you are willing to pay for that need. For people recruiting for more than 100 jobs per quarter, the top willingness to pay is 2X their current pricing. At the lower end, there is the potential for a smaller plan than currently offered. How many SaaS companies have sales teams of just 1 or 2 reps? Thousands. At the moment they are priced out, but a smaller plan could open up an entirely new customer base for LinkedIn. At the upper end, the ranges here are huge. Larger sales teams are willing to pay 5X what smaller teams want to pay. 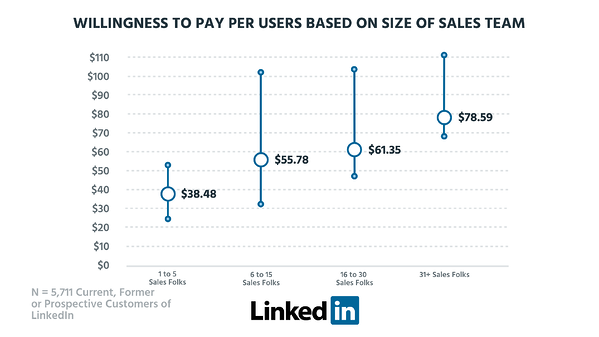 LinkedIn could tier out a premium option for large sales teams that adds another 50% on top of their current pricing and captures even more customers. In both these cases, customers are hiring LinkedIn to perform a certain task—find good hires and find good prospects. In both cases, people are willing to pay highly to make these jobs easier. In May 2015, LinkedIn acquired online course provider Lynda.com for $1.5billion. What does a social network want with an online university? The core feature that everyone expects is unlimited people browsing. At the moment, LinkedIn does limit the information you can find for some people. The differentiable features are the ones that are going to drive conversions. 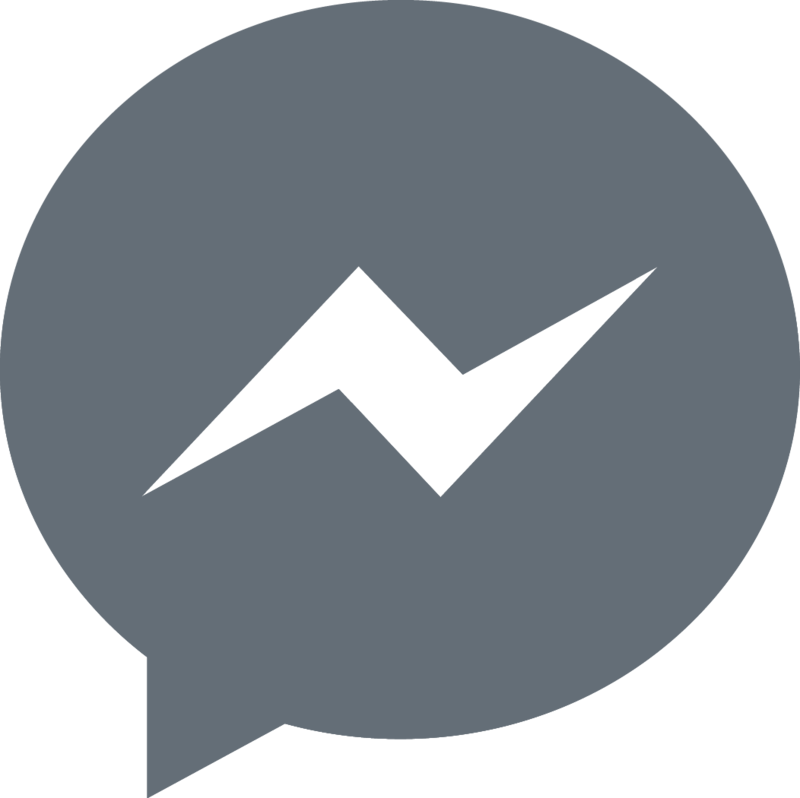 The vanity feature of knowing who is checking you out is highly valued here, as is the ability to message others you aren't yet connected with via Inmail messaging. But it is the upper-left quadrant that is the most interesting. These are the add-ons, features that only a few people want, but when they do they are willing to pay highly for the extra value. 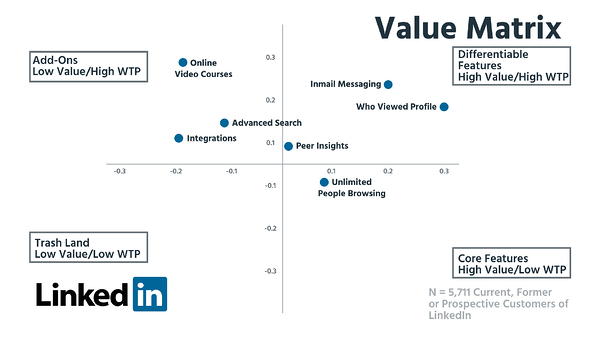 From these three, online video courses are the highest value. By buying Lynda.com, online courses geared towards business skills run by experts, LinkedIn is further building the idea of itself as the social network of the professional. You sign up for LinkedIn to further your career. You see what skills you are missing to get your dream job. You pay extra for a course from Lynda to get those skills. 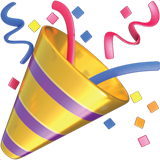 Recruiters can then see in your profile that you took the course. The upsell the fits naturally into the use by the customer. LinkedIn's pricing is difficult to navigate. It has both consumer and business pricing. It charges a lot spread across different segments. But it could be even more complex and make even more money. By tiering pricing and incorporating expansion revenue from add-ons into the packaging, LinkedIn could easily pass the $1 billion revenue mark. Check out the full video for exactly how Patrick and Peter think LinkedIn could be doing just that.